I do not own any right to this image. All rights and credits to the original artist. Season 1: Sam tries to run away from what he is supposed to be, but we all know how twisted destiny is, and it was destiny itself that brought him back into the hunting business, once again making him hunt down the demon that took his mother along with his older brother Dean, along side finding their missing father. 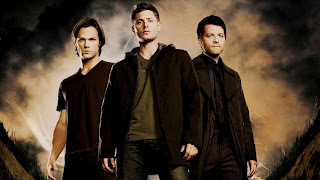 Season2: Season 2 is when Sam and Dean finally kill the Son of a b*&ch (Hey its an under 18 blog lol) yellow eyes and unfortunately Sam and Dean's Father dies. Also it is in this season we come to know the horrible past of the boys and their family. Season 3: Season 3 is based on Dean's soul going to hell because of a deal he makes with a cross road demon to bring back his one and only family, Sam, back from the dead. During this season Sam and Dean try to find many ways to wiggle themselves out of the deal. Season 4: Season 4 is the return of Dean from Hell. This is also the season where Angels are introduced in the show starring Misha Collins as Castiel. The Angels are back on earth because there is a rumor that a demon named Lilth is trying to free Lucifer out of his cage, which the resultant action is the great apocalypse. Season 5: Season 5 is stopping the freed Lucifer and Michael from having their great battle. With the help of Gabriel, an archangel who ran away from heaven Sam and Dean shove the devil back in the hole. Season 6: In season 6 Sam who was also cast down into the devil's hole is raised and brought back to earth and while Dean lives a peaceful life with Lisa and Ben as Sam had asked him to, Sam continues to hunt along with his grandfather Samuel alphas of every monster they have hunted. Another issue in the season is Sam even though physically present on earth does not have his soul, which was left in the devil's cage. is when Sam soul which is heavily scarred by Lucifer and Michael and returned to him with the help of "Death". Castiel who is fighting a Civil war in heaven is in search of Purgatory to consume all the souls in him to stop Raphael from starting the apocalypse again. In spite of Dean's desperate plea of stopping Castiel opens the door of Purgatory releasing the Leviathans. Season 7: Season 7 Sam whose wall is broken is now in pieces and hallucinates about Lucifer. Castiel who was almost dead is completely fallen and carries a huge burden for the mistakes he did in past. Castiel loses his memory and lives as Emmanuel a spiritual healer in a near by town but regains his memory when Dean refreshes it along with Meg a demon. Castiel takes the scars of Sam onto himself making him insane. Mean while Sam and Dean desperately try to find means and ways of killing Leviathans. So after all this, Supernatural is gonna be on air for the 8th season as well. Haha I guess the journey never ends!